After breakfast, we traveled through the mountains to the Latis Valley, located on the other side of the Sacred Valley, on a scenic journey through the tiny villages dotting the mountainside. As we departed from Ollantaytambo with our small van zig-zagging up the mountain, we watched as rugged streams and sprawling green hills rolled by. After about an hour, we reached the first village, where we were introduced to several locals who were so kind and quickly became our friends in a matter of minutes. We learned about how they live their day to day lives before continuing on another hour or so until we reached the Andean highlands. As we stepped out of our vehicle and felt the hard crunch of gravel underneath our feet, a clumped mass of white alpaca caught my eye. Juan and his family were there to greet us with big hugs, and in the distance I could see hundreds of alpaca gathered together for the blessing. The blessing ceremony is very special, as the people believe it brings good luck and health to their animals, which are an important part of the livelihood in Peru. First, all the llamas are gathered together, and the youngest are brought forth to the front of the herd—our baby llamas were just 2 weeks old. Cocoa leaves, incense, feathers, and other items are gathered up in a pouch and burned. Special water is thrown over the tops of the llama heard, and the baby llamas are decorated with flowers & natural colors as prayers are spoken. At the end of the ceremony, the people dance around the herd with flags and vibrant clothing until all the llamas are released back into the mountains. In the late afternoon, we continued onwards to Juan's village for a traditional Pacha Manca lunch. 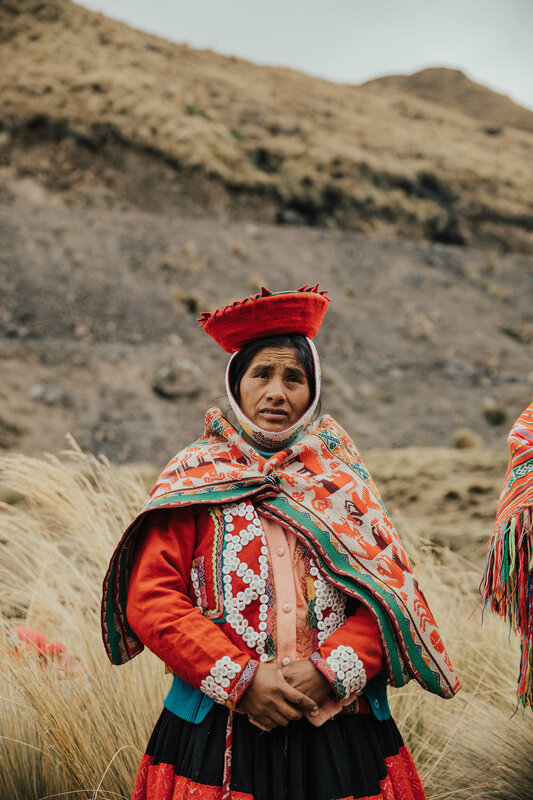 Pachamama is the Quechua word for "Mother Earth," and as it holds a lot of significance in Peruvian culture, it was very fitting for our dining experience. The food was cooked in the ground in an oven that was dug from the earth. All the ingredients for the meal were harvested from the land, including potatoes, lima beans, squashes, bananas, and meats. After our lunch, we traveled to Pisac to visit the local markets and buy traditional Peruvian textiles & ceramics—two of the best souvenirs you can bring back from Peru. It was such a great day and one I will never forget, as some of the best experiences cannot be planned for. If you would like to experience a traditional Llama Blessing Ceremony and immerse yourself in the culture of Peru, travel with us on our Classic Peru Expedition.